Hi, my name is Matt Brown, and I am a software developer in the NYC area. This site is a collection of some things I’ve written. I cowrote a blog article about things my team at Spotify has been working on the past few months, primarily focused on how we use Cassandra. Press ⌘ ⌥ T to bring up the Character Viewer. 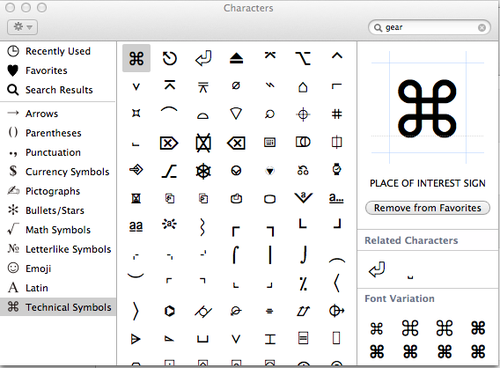 The command symbol (⌘) should be the first in the list. From here you can drag and drop the ⌘ to whatever text editor you want - although a keystroke to type it would be far easier rather than opening Character Viewer each time. Stackoverflow has a solution for this problem. 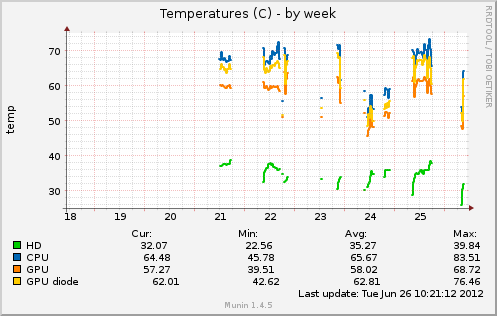 Last week I made a plugin for Munin to collect the temperature of my Macbook’s CPU, hard drive, and GPU, for no real reason other than I thought it would be need to see how they change over time, and because graphs are irresistible. The plugin is on github. It requires a free app called Temperature Monitor to be installed so the temperature values can be collected in a script (I could not find any way built into OS X to collect the data from the command-line, like you would read /proc on Linux). Here is the solution to a problem I recently debugged which I had a very hard time finding any information on via Google. Hopefully this helps someone else in the future. When programatically generating iCalendar (.ics) files, iCal on OS X (at least on my Snow Leopard version, 4.0.4) seems to refuse to recognize that the event is recurring if the VEVENT contains a RECURRENCE-ID element. Outlook 2011 and Google Calendar recognize the first example as hoped for (shows an event that repeats on first Thursday of the month four times). It’s not clear to me from the RFC which behavior is correct - the meaning of RECURRENCE-ID seems confusing. Highlight a word in almost any app, press Cmd + Ctrl +D, instant dictionary lookup. Ben Kamens posted today about changing his opinion on required code reviews from the negative to the positive after a change in policy at Khan Academy. Having moved within a company from a team that had nothing close to approaching a code review policy, to a team that almost-religiously does code reviews on changes regardless of size (with one caveat, it’s not required for someone to “OK” each review/change), I can safely say that having a code review process is a huge bellwether of the overall quality of a software team. I would never want to work with a team in the future that didn’t already do code reviews. It makes such a huge difference in the quality of the code produced, the level of understanding of each person on the team as to how things actually work, and education among people on the team in all sorts of ways (on best practices, tips and tricks, cultural things the team prefers, etc). It doesn’t slow you down, or increase the amount of process - it just makes sense. As a developer, looking at code all day is what you should be doing in the first place anyway. Khan Academy’s official policy on code reviews is a good read too. In case you are an idiot like me, here is a simple set of steps for verifying a PGP signature (for example, if you are downloading the TrueCrypt installer and you want to verify that the binary is intact). If you already have GnuPG or another PGP client installed, skip steps 1 and 2. Accept all of the default options. Download the public key of the person/institution you want to verify. For TrueCrypt, their public key is available here. (change the filename to whatever is appropriate). gpg: Good signature from "TrueCrypt Foundation "
Java offers a few ways to generate random numbers, the default being java.util.Random. java.security.SecureRandom offers a more-secure extension of java.util.Random which “provides a cryptographically strong random number generator”. “Cryptographically strong” sounds like something everyone would want, right? Why generate weak random numbers if you can generate secure random numbers instead? If you want a cryptographically strong random number in Java, you use SecureRandom. Unfortunately, SecureRandom can be very slow. If it uses /dev/random on Linux, it can block waiting for sufficient entropy to build up. In this implementation, the generator keeps an estimate of the number of bits of noise in the entropy pool. From this entropy pool random numbers are created. When read, the /dev/random device will only return random bytes within the estimated number of bits of noise in the entropy pool. /dev/random should be suitable for uses that need very high quality randomness such as one-time pad or key generation. When the entropy pool is empty, reads from /dev/random will block until additional environmental noise is gathered. If you don’t read the descriptions carefully enough, you might miss the fact that /dev/random will block when there is not enough entropy data available. This means that in practice, it’s possible for your calls to new SecureRandom() to block for an unknown amount of time. This is great if you truly need a very strong random number - return random data generated by the environment rather than a pseudo-random number generator, and if there is none available wait until there is some more - but is a really poor choice if you don’t need a super-secure random number and just a random-enough number will do. It’s a bad habit to use SecureRandom everywhere by default, unless you truly want to make sure your unit tests or other code-that-doesn’t-need-to-be-that-secure randomly block for long periods of time in certain environments (hint: you probably don’t want this). Unpredictable blocking is a very bad thing for most applications.